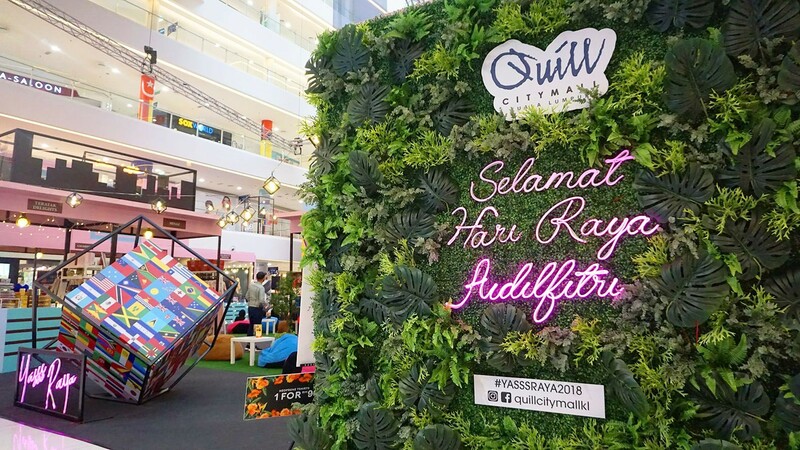 Ramadhan is a very festive season to enjoy if you're in Malaysia, being one of the biggest yearly events other than Chinese New Year, Deepavali and Christmas, this occasion is generally celebrated by Muslims from all around the world, and this year around from 17th May to 12 June 2018, Quill City Mall Kuala Lumpur is honoured to present the momentous celebration of the grand launch of Yass Raya 2018! Now, as much as I would like to talk about the fancy decorations, im pretty sure for those who are looking for the perfect Raya outfit for 2018, Quill Mall City Mall is your one-stop center to find the perfect outfit! 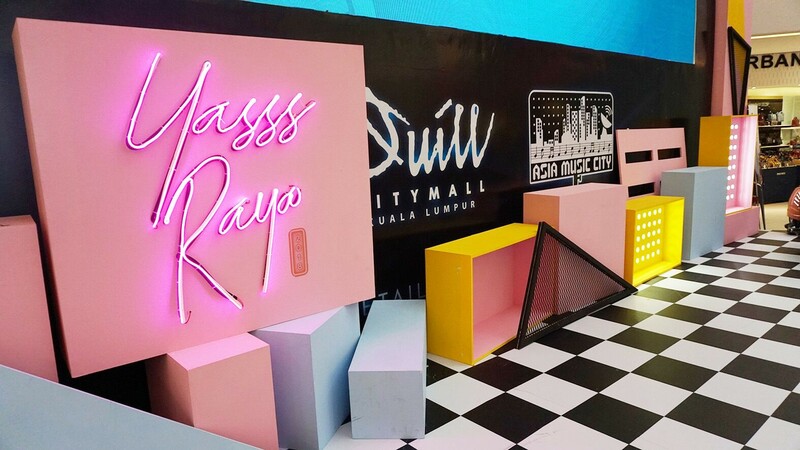 The setting of the whole layout of Ramadhan decorations at Quill City Mall scratched out the 'balik kampung' theme and created a more modern theme comprising of pastel color and neon lights, a semi-hipster decoration. I personally think that the whole concept reflected with the featured sellers who opened their booth at Quill City Mall in conjunction to the Ramadhan festive season. 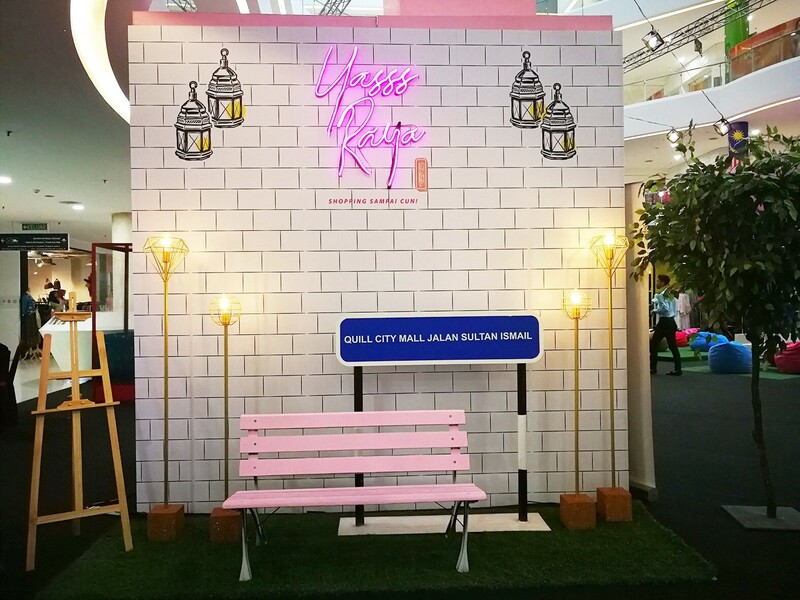 Make your way there and be impressed with the fashion collections for the young, with more than 1,000 Raya collections and more than 40 booths comprising of clothes for a semi-hipster Raya. If you're looking for new clothing this Raya, you may find amazing clothing by famous celebrity collections from Rozita Che Wan, NSA Beauty Official, Mora & Haze, Claqisya, Lily Petuna, Minaz, Teratak Delights, Shelle'e Belle'e by Azura Couture, Furby & Sugar, Anzel Hair, Gajah Duduk, Petra RTW, El.Elfiraloy, Dlasha, Fana Couture, Dyxy Cosmetics and more! The Raya fashion booths are located a the Main Entrance and Main Atrium of the mall. Trust me, the ambiance in Quill City Mall was pretty magical with all the festive sparkling lights, and there were also plenty of sharp, bright, vibrant neon lighting effects that can be seen lighted up at the Main Atrium. In the image above, you would see that there are grass carpet areas at the Main Atrium for family and youngsters to Buka Puasa to have a chill out session as they break their fast on colorful bean bags. If you're creative enough, you can even get some really good insta-worthy photos while you're there! 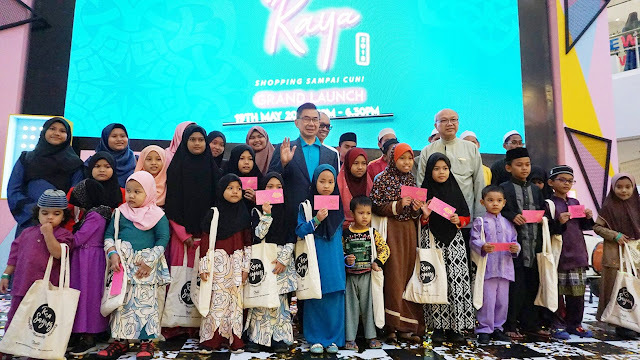 Being present at their launch, Quill City Mall also had a corporate social responsibility initiative by welcoming 50 children from Pertubuhan Kebajikan & Penjagaan Nur Hidayah for a 'Majlis Berbuka Puasa' in conjunction with the month of Ramadhan. The children were invited to spend their day at Quill City Mall KL for the upcoming Raya Celebrations too! How sweet? I always have a soft spot for malls who put the extra effort in making sure that everyone, including the less-fortunate to have a great time during a festive season. Psst, these kids were so lucky that they got Raya packets from the management of Quill City Mall too! There will be Unique Raya Redemptions of Yasss Raya Packets, Yass Raya Lucky Grab, Carousel Ride, Yass Raya Photo Contest, and much more awaits at Quill City Mall! 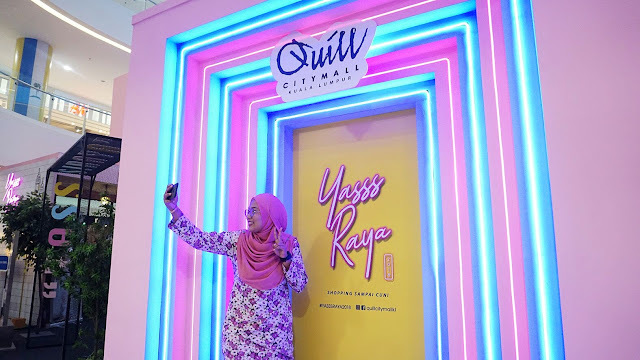 You can also stand a chance to redeem limited edition redemptions and win attractive prizes during Yasss Raya 2018 when you drop by to Quill City Mall. Contest period of the photo contest would be from 17 May until 12 June 2018, and one photo is equivalent to one entry where THREE (3) winners will be randomly selected to be entitled to win RM500 worth of shopping cash vouchers! Minimum purchase RM350 : UOB Travel Nexk Pillo2 + 500 AirAsia BIG Points. 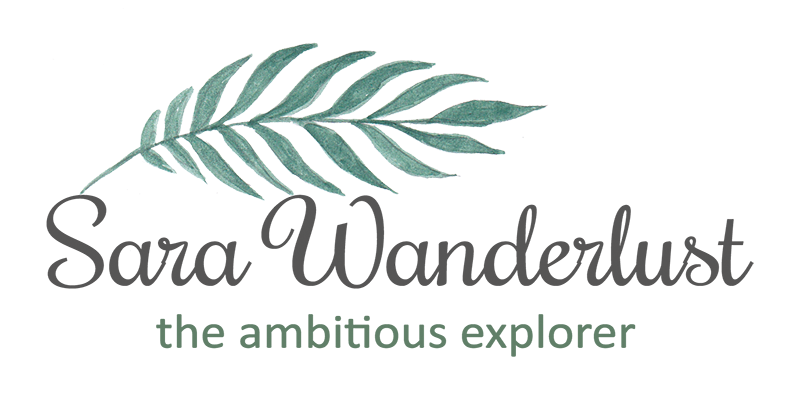 Shop, Dine, and Win: Prizes up to RM15,000 to be won! AirAsia BIG Points Loyalty Program: Redeem more BIG points than usual. So that's about it! Quill City Mall KL is easily accessible via highways and public transport (Medan Tuanku Monorail Station) providing convenience to shoppers as well as visitors to have a great Raya shopping experience. Free parking is available after 5pm onwards on weekdays whereas RM3 flat rate on weekends. Be sure to also get yourself a copy of their Yasss Raya 2018 booklet for further details of their Raya Campaign.